This afternoon, my husband mentioned that we should find something to do with the 2 packages of crescent rolls we didn’t use for Thanksgiving. So I went to Pinterest and there it was. 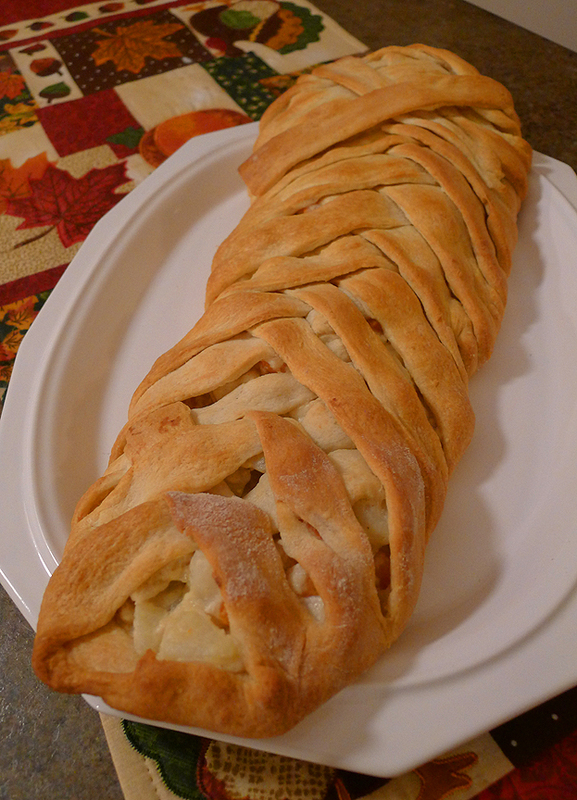 The Chicken Pot Pie Crescent Braid. It was fantastic and not as difficult to make as I thought it would be. I would definitely make this again! It’s rich and creamy and perfect for a winter evening. 1. In a saucepan on medium high heat, combine the carrots and potatoes. Bring to a boil. Boil for 15 minutes or until vegetables are tender. Drain and set aside. 2. In a saucepan over medium high heat, melt the butter Turn the heat to low and whisk in the flour, salt, pepper, and minced onion. Slowly whisk in the chicken broth and milk. Simmer until the liquid becomes thick. Add in the cream cheese and stir until well combined. 3. Add the vegetable-chicken mixture with the sauce. Mix well. 5. 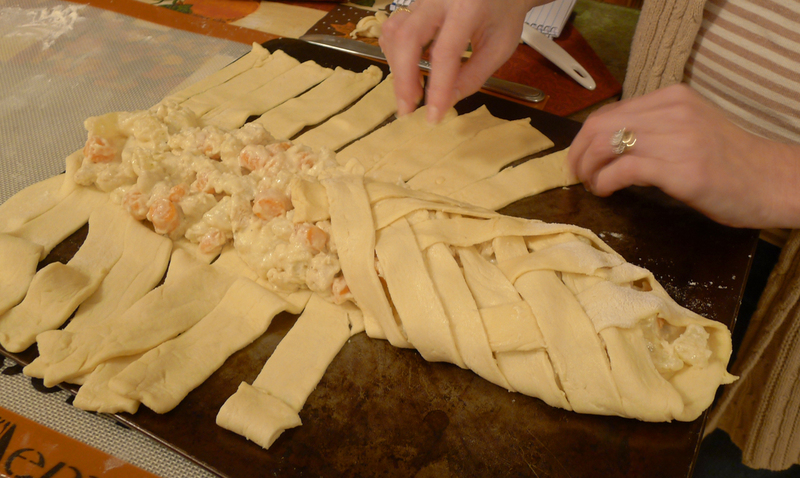 Take your filling and spread it up and down the center. Starting with the end closest to you, take the strips and place them over each other, like you are braiding them. Continue to do this with each strip until you reach the end. 6. Seal any edges that you may see to prevent the filling from leaking out. 7. Bake for 20-25 minutes at 375 or until the top is golden brown. * The recipe that I got this from used crescent seamless dough sheets, I did not have those, so I adapted the recipe to the regular crescent rolls that I had on hand. They worked just fine. 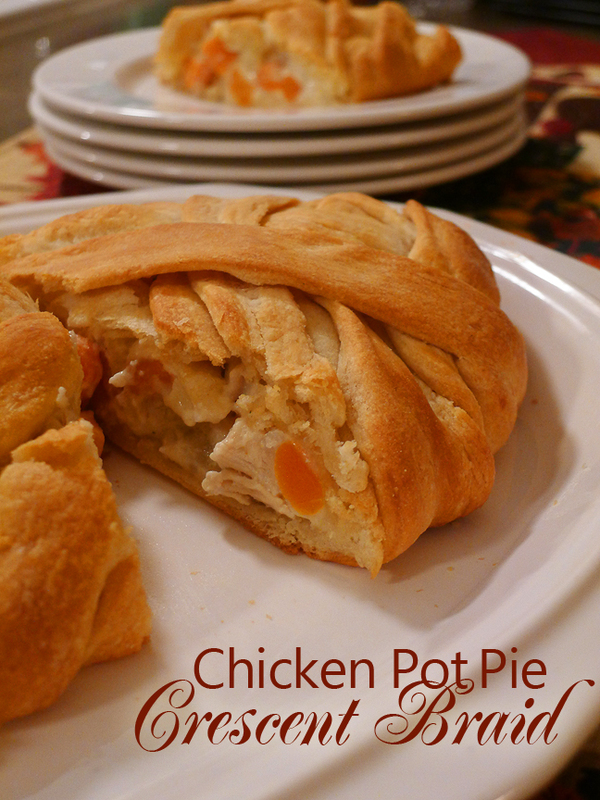 This entry was posted in chicken, dinner, main course, menu plan, recipe and tagged chicken, crescent roll, dinner, pot pie, recipe. I often make chicken pot pie but usually the traditional way. This looks like it would be more interesting as it is served!